Since 2006, eye doctors have been recommending a high dose of antioxidants and zinc for AMDpatients to reduce their risk of getting advanced AMD (bleeding at the macula). The doses of Vitamin C, E, beta carotene and Zinc recommended are much higher than our daily recommended intake and supplements have to be taken daily to get such high doses. This is based on the landmarkAREDS study done in the USA which was conducted on almost 5000 patients who were randomized to receive either the high dose supplements or placebo. They were then followed up for 5 years and the patients taking the supplements were found to have almost 25% lower risk of getting advanced AMD. Some reports have suggested that taking high doses of omega 3 fatty acids may reduce the risk of AMD. There is also concern that high doses of beta carotene may increase the risk of lung cancer in smokers or ex-smokers. Lutein and zeaxanthine are considered to be better sources of carotenoids (pigments found at the macula which protect the macula from AMD). In 2001, it was not possible to put lutein and zeaxanthine into a supplement form and beta-carotene was chosen instead. 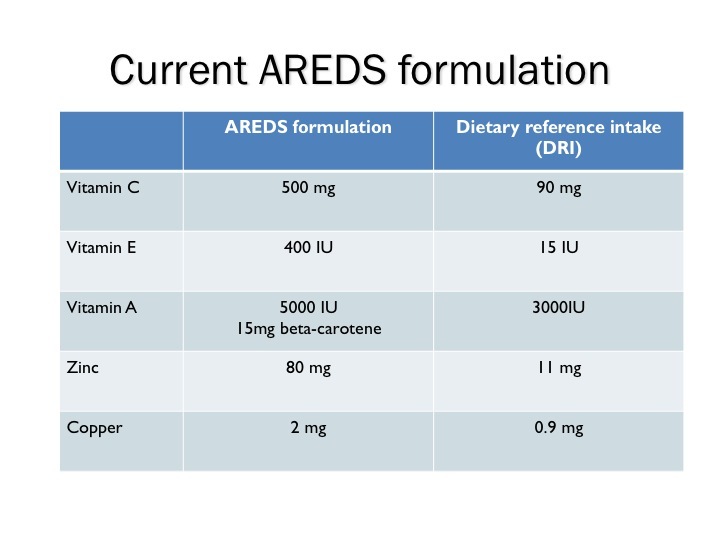 The AREDS2 study was started in 2006 to look at whether giving high doses of omega 3, lutein and zeaxanthine for AMD patients could reduce the risk of advanced AMD. The long awaited AREDS2 study results were announced this week. It was a bit disappointing. There was no benefit found in taking high dose omega 3 supplements in addition to the current AREDS formula in AMD patients. 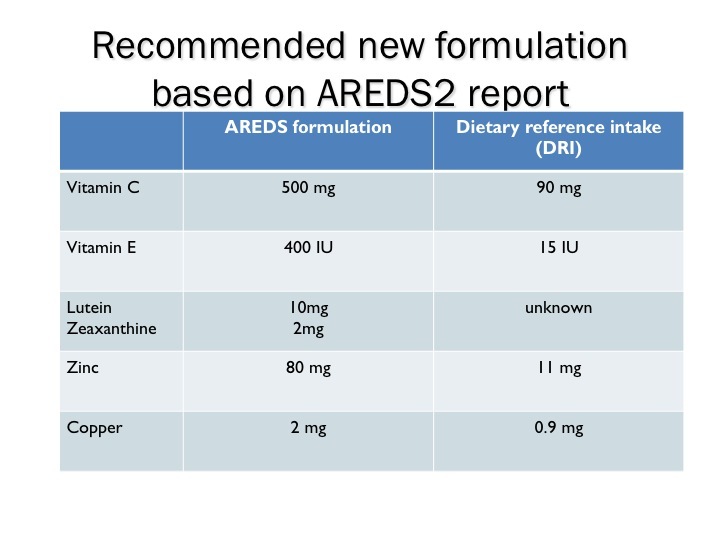 There was also no benefit found when high dose lutein and zeaxanthine were added to the current AREDS formula. However, the positives from this study were that in patients who are not taking enough lutein and zeaxanthine in their diet, they had a reduced risk of advanced AMD when they were given high doses of lutein and zeaxanthine. AMD patients who were not taking any beta carotene supplements also benefited from high doses of lutein and zeaxanthine. There were no recommendations made regarding the best dose of zinc to take. So, eye doctors are now recommending a revised formula for AMD patients to take to reduce their risk of getting advanced AMD and sight loss. High dose beta carotene should no longer be taken and ,instead, high doses of lutein and zeaxanthine should be used. This will give the protective effect to the eyes of AMD patients and have no added risk of lung cancer in smokers. No recommendations were made about taking omega 3 supplements.